We specialize in music for all occasions including, weddings, anniversaries, birthdays for all ages, schools, company events, and many others. 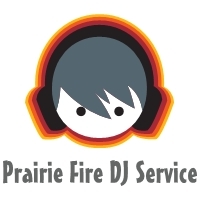 Prairie Fire DJ Service provides a premium sound system that can accommodate areas large and small, inside or out. We offer a large music selection from the 50's to the latest current hits. We take pride and personal interest in each event. We are also committed to making your event the most memorable time of your life. Feel free to contact us with any questions. We look forward to working with you! Whether you're looking for a DJ for your wedding (or other special event) or Karaoke for your bar or party, Right On Q has experience all over Central Illinois to meet your satisfaction. Our personal touch means you're not just hiring us to "show up and play music". We put full time hours into our work for each event. This is our job, not side work. We take our business and your event very seriously, and put that energy back into our planning process. From creating custom playlists to altering our (always included) dance floor lighting to match your colors, we make sure our work reflects your event in the brightest light possible, because when we sine, you shine!